History seen through a tent flap: this view of post-settlement Australia is ‘alive and itchy’. The act of camping strips us bare – quite literally, sometimes, when every piece of clothing is wet through and it is easier to simply offer unadorned skin to the sun. For people who normally live in houses and work in buildings, camping gives a sense of a return to essentials, of starting from scratch. 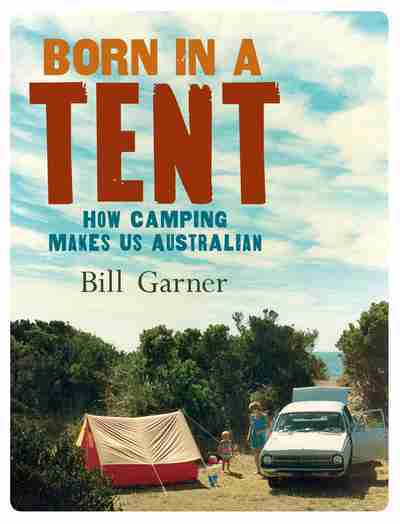 Bill Garner’s Born in a Tent was born in a PhD, but you won’t find any impenetrable academic prose here. Garner writes intelligently but straightforwardly, letting his own personal experiences weave their way through the text. His research, assembled into a circling case about how the act of camping has shaped our nation, offers endless nuggets of pure delight, such as the image of Arthur Upfield, author of the Napoleon Bonaparte detective books, cycling out into the bush on a bike without pedals, carrying a shotgun, fishing lines, a light tent and ‘perhaps a cat or a pup in a sugar bag’. Garner looks out over the history of (colonial) Australia from the flapping canvas opening of a tent, from the first unfurlings in the new Sydney settlement, through the tents of explorers and squatters, diggers and shearers, artists and writers. This is visceral history, alive with biting insects, dripping clothes and the blessed relief of billy-boiled tea. In Garner’s hands, history is alive and itchy. While other nations might look back over a history of wars and coups and beheadings, Australian history can be seen as series of camping events. To be a squatter, you had first to squat. To set up a capital city on a paddock, you had first to set up a vast campsite of workers that would toil on your new parliament house. To shear sheep, you had to move from station to station, camping along the way. Gold diggings were just great big campsites. Camping, says Garner, is a form of play, even when it is a necessity. When camping, one ‘plays house’, inventing new ways to live. Campers must decide how people are to be fed and watered and bedded down; how they are going to keep warm, or cool; how they are going to go to the toilet. As colonial Australians extended their range, camping allowed them to learn about the land and work out how to live on it. It makes intuitive sense that all this camping would shape the character of the nation thus under construction. It makes sense that there would be a rejection of stuffiness and ‘conventionalities’ and a nurturing of the direct, open socialisation of the campsite. Those famous ‘Australian’ virtues – mateship and egalitarianism – might logically be forged in a campsite. Reading and enjoying this book, I began to wonder, however, if camping is not a more neutral vessel than Garner suggests. Something that can support discipline, militarism and imperialism (think the Romans, boy scouts, the police camps that faced off with shearers’ camps during the strikes of the 1890s) as well as peace, love and anarchy (think Nimbin, artists’ camps) may not be, in itself, capable of shaping society in one direction or another. Surely the point is not camping but who is doing the camping? I looked at Garner’s sweeping subtitle – ‘How Camping Makes Us Australian’ – and wondered why we need to keep launching ourselves at this endlessly slippery, shape-shifting beast, this ‘Australian identity’ we keep trying to define. But fortunately, Garner’s ‘Australian’ encompasses much more than a laconic bloke in a hat with dangling corks. It includes eccentrics like Daisy Bates, the well-dressed Irishwoman who spent decades camping alongside Aboriginal camps, and the women of bird-watching clubs, and the people who set up and still continue to camp in the Aboriginal tent embassy outside Old Parliament House. Rather than a one-dimensional view of the meaning of camping, Garner’s analysis allows for a range of meanings, or contested meanings, to arise from the same activity. So for example the Aboriginal tent embassy ‘plays to deep fears of rootlessness and illegitimacy that haunt the New World settler – being a camper on someone else’s land’. As I read this book – I’d like to say I read it under a gum tree by a river with a thermos of tea at hand, but I was in fact lolling comfortably on my own sofa – I went back over my own camping memories. It struck me that Garner’s accounts were often (not always) of highly social campsites, where many people gathered – workers, families on holiday, teams of convicts – and had to muck in together. My early experiences were more anti-social than that. We lived in a remote town in north-west Western Australia and Dad would take us out to yet more remote locations, into landscapes inhabited (it seemed) only by us. Vast stretches of beach without another soul on them; red dirt and low scrub to the horizon; at night, a Milky Way that arched over us luminous and close. I want to protect this profound, personal experience of nature (or so it seems to me, now that I’m a long way from the midgie bites and sunburn) from the taint of Nation, however generously that may be defined. Perhaps it’s impossible to protect it. I watch a stationary cloud, waiting for it to move. A leaf spirals the long way to the ground. Four kookaburras sit on a log, shaking their gowned shoulders. Tracy Sorensen is a writer and filmmaker. She lived in Newtown in the 1990s but is now in Bathurst, where riotous camping occurs during the yearly car races. You can visit her website here. To see if this book is available from Newtown Library, click here. Fabulous topic! I always loved Alan Marshall’s “These are my People”for its camping ( with horses!!!). Hi Bill – I enjoyed the video clip of your talk at the Wheeler Centre. Looking back over the history of Australia as a series of camping events brings the physicality of the experiences alive for me. Very interesting to think about foundation stories and how they are usually connected with some sort of personification (the ANZAC, the digger, etc) and whether it’s possible to have a foundation story that is disconnected from a type of person and clipped on to a social practice. I love that idea – as you say, that is beautifully inclusive because it’s about things we’re doing together and the people doing it can be all very different, from hardy working class blokes building railways to middle class ladies watching birds. But story without personification is a hard call. We keep looking for the “Aussie” and then I get the shudders about the Shooters and Fishers party arguing for a continuation of an “Australian way of life” that is hostile to national parks and marine parks and wants the sort of unfettered access we all had right up until recent times. But if we can recast being an Australian as a person (any kind of person, from pig hunter to twitcher) experiencing a direct connection with the Australian earth through camping, then that would be a wonderful thing. I do feel that, when camping – that, along with others, I’m experiencing the timeless beauty of this continent. Well, Tracy, all we can do is put the idea out there and see if it flies. Thanks for your review.